I was greeted at the National Film and Sound Archive by the alluring colours, illuminating the face of the building. Light chatter echoed around the marvellous entrance as the typical artsy crowd shuffled in. 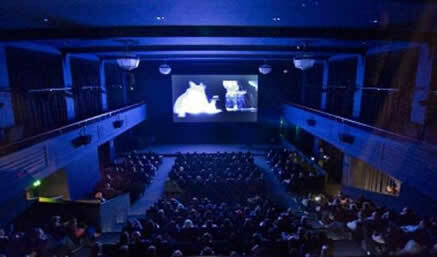 Short Seasons film festival produced by ScreenACT, showcased the work of our talented local filmmakers. Short Seasons powered off with a cleverly crafted animation called White Wednesday, produced by the Academy of Interactive Entertainment (AIE). White Wednesday features a bird ‘bombing’ the animated world he inhabits. The bird concludes his target practise when he encounters the love of his life, a statue. For a film with no dialogue, White Wednesday delivered a humorous and engaging experience. The audience laughed along and the bird’s adventure was thoroughly enjoyed. On the night we enjoyed two animations, the second being a beautifully produced, live puppet film, Daybreak, by experienced illustrator and animator, Les Peterson. Daybreak is about two puppets that live on the moon and peddle a bike which makes the sun rise every morning. When one of the puppets decides he doesn’t want to ride anymore we discover the metaphor of comradeship and teamwork. It’s always a pleasure to be enriched by a wholesome documentary. We all loved All Stops to Canberra. A documentary taking a historic look at the Canberra railway and how it played a pivotal role in developing our capital. The steam trains were decommissioned and left to rust until a group of passionate enthusiasts volunteered to overhaul them and get them chugging again. Beautiful cinematography by Aaron King combined with historic footage and great interviews made for a splendid story. The stand out film at Short Seasons was Risk. Written, produced and directed by the young and extremely talented Declan Shrubb. The 12 min short film captivated and engaged the audience the entire time. This seemed like a high degree of difficulty considering the flick was shot on one location, in someone’s garage. The beautiful slow, sliding shots around the table would have been very difficult to light, but were delivered seamlessly. The script was tight and the lines were delivered brilliantly, rich with emotion. The Way Home, directed by Choung Vu was a powerful drama about an adolescent teen who is dealing with the loss of a mother while discovering his younger brother has cancer. The script pulls at the heart string with the struggle between father and son while the younger brother seems to be staying the strongest. Outstanding acting by Brendan Kelly had the audience totally captivated. The final film Blow Up, created by popular filmmakers, John Frohlich and Christian Doran was a perfect film to wind up the festival. The story follows a young university student sent to the bush for work experience with a scientific researcher. The two have an awkward sleeping arrangement in the same tent and the humour explodes as the university student thinks of a highly creative and hilarious way to stop the researcher snoring. After the final short film, patrons congregated in the marvellous entrance once again and sipped wine while discussing favourite films and chatting to directors about future projects. Needless to say the talent of the local filmmakers shone through and ScreenACT put on a fantastic event for the local film calendar. Well done guys.